It was after a series of exhausting investigations that you decided to take a well-deserved break by offering yourself a trip on board the most prestigious train of the Belle Époque: the legendary Orient-Express with its flamboyant luxury. You couldn't have foreseen what was going to happen... just minutes after the train left, a grim news spread in its corridors: a terrible murder had been committed, and no one knows by whom or why! 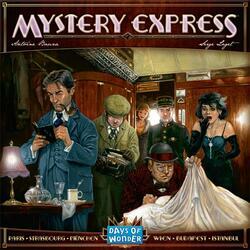 Mystery Express is an investigative game from Days of Wonder. A murder has been committed on board the Orient-Express and the players play the role of investigators who must strive to find the five elements, represented by cards. The winner will be the one who, helped by his or her special ability, will discover who committed the crime, where, when, how and why. Created by Antoine Bauza and Serge Laget, and served by meticulous illustrations and high-quality equipment, Mystery Express is a game that ingeniously renews the classics of the genre.